Elvis Aaron Presley was born in Tupelo, Mississippi, on January 8, 1935, to Vernon and Gladys Presley. Born in a two-room house built by his father, grandfather and uncle, Elvis was one of twin brothers born to the Presleys. His brother, Jessie Garon, was stillborn. Elvis grew up in Tupelo surrounded by his extended family including his grandparents, aunts, uncles and cousins. 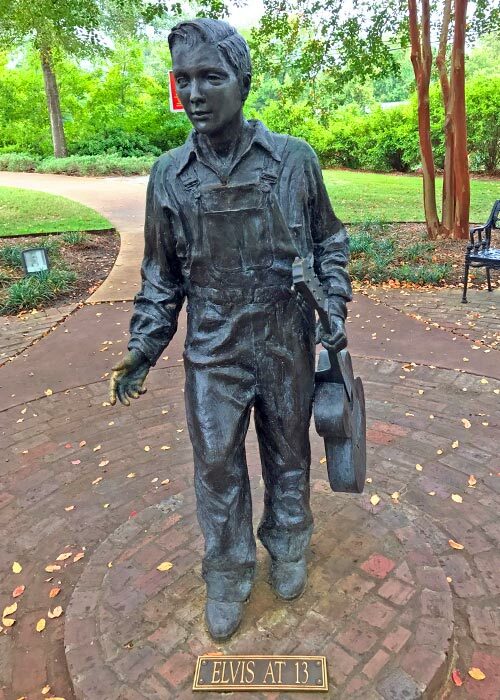 At the suggestion of an Elvis fan from Ireland, the Elvis Presley Foundation commissioned an impressionistic bronze likeness of Elvis at age 13 to be displayed at the Elvis Presley Birthplace Park. Elvis is portrayed in oversized overalls, a full open-collar shirt and plain shoes as evidence of the poverty and humbleness of those early years. The statue is life-sized and displayed at ground level so that fans can more directly relate to Elvis as a person. The sculptor worked from photographs now displayed in the museum to determine Elvis’ facial features, hairline and general body size. His height was calculated from a sixth grade class picture by comparing him to the height of another classmate in the picture and by measuring the brick and mortar in the background wall. 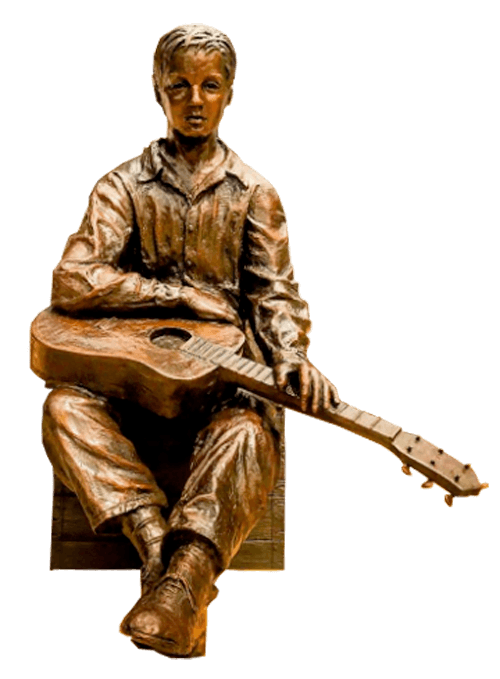 The sculptor envisioned Elvis walking to the Tupelo Overlook where he would sit and play his guitar and dream of a better life. 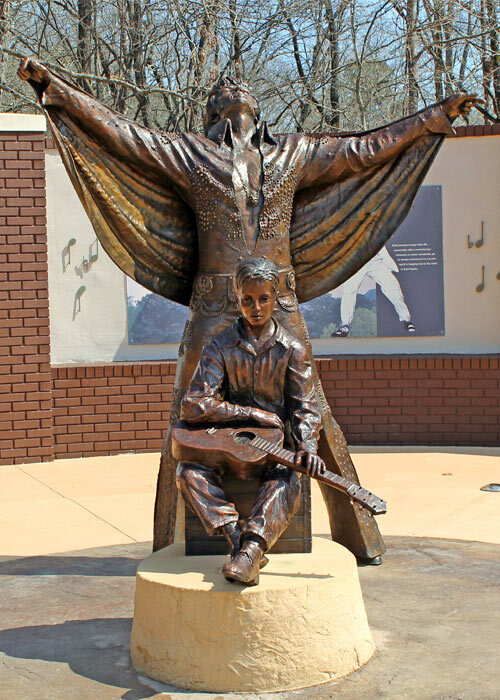 The statue is positioned with the chapel on his right and the museum to his left symbolizing the strong spiritual values he learned in Tupelo and the challenge of materialism he would eventually face in Memphis. In August 2002, the statue was unveiled and dedicated to fans worldwide. It is one of the most popular photo opportunities at the Park. 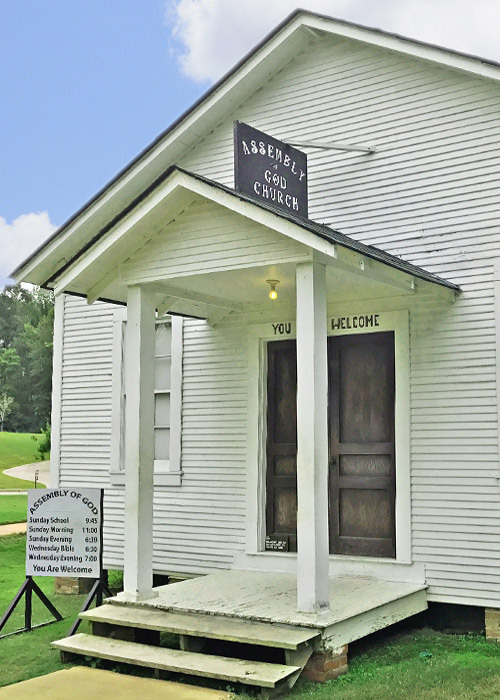 The actual building where the Presley family attended church services has been moved to the Elvis Birthplace, Museum, Chapel and Park for visitors to experience and enjoy. 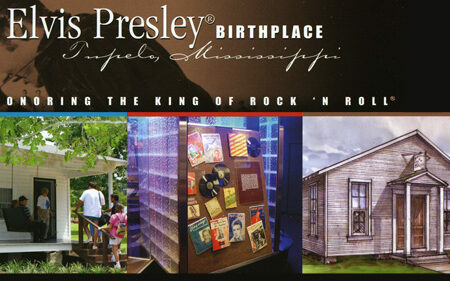 It was here that Elvis was first exposed to the rich, Southern gospel that became a staple of his musical repertoire. According to Assembly of God minister, Brother Frank Smith, Elvis was fascinated with music and the prospect of learning to play the guitar. Brother Frank taught Elvis how to make D, A, and E chords…all he needed to play “Ole Shep”. Today, visitors can experience the Assembly of God Pentecostal services of the 1940s through a rich multimedia presentation. The plain, humble, wood-framed structure will greatly contrast with the lively and intense nature of the sermons and the music. Guests will experience the preacher walking about, the choir filled with the spirit, and the congregation swaying to the rhythm of inspiring praises. Elvis never realized his dream of becoming a member of the Statesmen or the Blackwood Brothers gospel quartets, yet throughout the rest of his life, Elvis recorded many of the beloved songs of his youth, the emotional and uplifting music of the church. Two statues known by one name. The story has it that as a young boy, Elvis and his friends would run the hills and hollows of this 15 acres of property. After one of those days, near the end of the day, perhaps Elvis picked up his guitar and walked up to the overlook. His hair was mussed from play. A hole in his sock from wear. His clothes were several sizes larger than needed. All this symbolizing the poor circumstances of the Presley family. 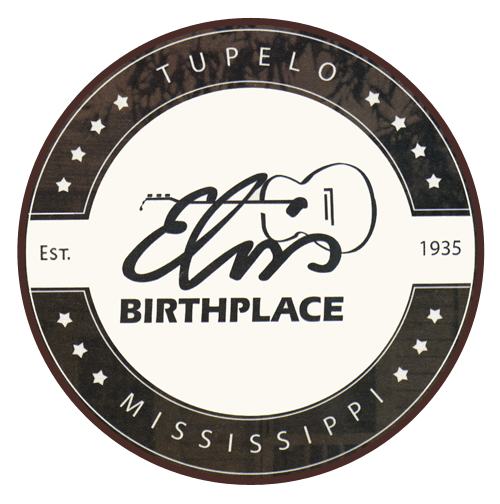 He sat on a milk crate, playing his guitar, then looked west toward the lights of Tupelo. 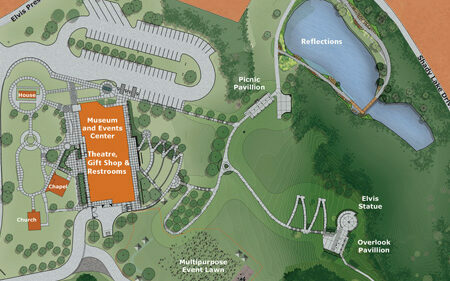 Perhaps it was here that Elvis “Dreamed the Dream” of a better life for himself and his family. Who’s to know for sure? But we do know the rest of the story. Standing atop the overlook for all to see, two statues known by one name – “BECOMING”. It symbolizes the transformation from Elvis, The Boy, to Elvis, The Entertainer. Both statues represent a slice of life of the same person born on common soil that serves as a base for both statues. Elvis became a larger than life personality with a revolutionary influence on music worldwide, yet he always maintained his humble spirit in keeping true to his roots and formative values in East Tupelo. 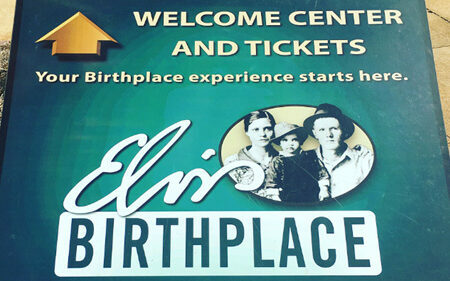 Since there is very little wait time when purchasing a ticket, tickets are sold only at the front desk at the Elvis Presley Birthplace. Walk the trails that Elvis might have walked. More than 100,000 visitors from around the world tour the Elvis Presley Center each year which includes the Elvis Birthplace, the Elvis Presley Museum and Memorial Chapel, and Elvis Presley Park. "Very lovely place. Will tell my friends." "Great collection of his life." "Visiting here makes our vacation complete." "I have no words. It's just beautiful." "Awesome stop along our road trip."